We can feel like the outsider in this world, can’t we? As if no one wants us. Maybe in your life you’ve been thrown out or discarded. Maybe you were part of a group and now you find yourself on the outside. This happened to the blind man. He’d been a part of a family, a part of a village and its synagogue, but when Jesus healed him the man found himself on the outskirts of his once full life. He refused to change his story that he’d been healed, and people who were once his friends suddenly didn’t want him around. Even his own parents distanced themselves from him. That’s what he does. When others discard, Jesus seeks. Our lives have value to him. He desires a relationship with us, and he sees us among the many. This man could have been lost in the sea of faces around Jesus, but instead Jesus sought him out to have relationship with him. I love that! 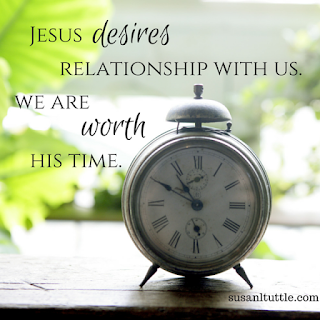 Jesus desires relationship with us. We are worth his time. This man had been physically blind, a beggar, nothing special about him, and yet Jesus saw his value. He didn’t stop at merely healing him, he went after him until he was in relationship with him. He cares so much more than about our physical. He’s after our heart. And your heart is worth everything to him. When others throw you out, Jesus comes running after you. Let him find you today. Lord, help me to let go of the hurt of others not wanting me and realize that you’re pursuing me. Let me see how much you love me and discover the beauty of relationship with you. Today let me focus on moments with you that deepen our relationship so that I can grow in you. It's humbling when you stop and think about Jesus pursuing us.